Valet Parking is $15 per vehicle. Drop-off is at the intersection of Lakeview and Deming, on the West side of the park. From there, the restaurant is a short walk into the park. Located within Lincoln Park, at the edge of a pond overlooking Chicago's dramatic skyline, North Pond can easily claim the city's loveliest setting. 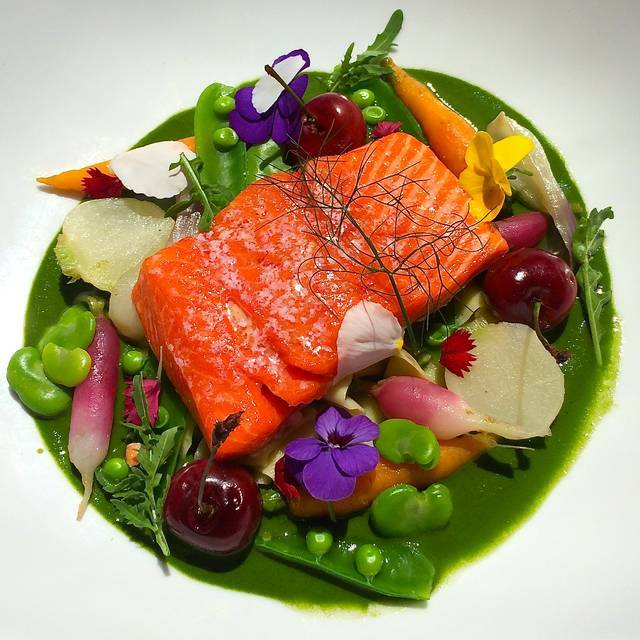 Inspired by the market, Chef Bruce Sherman utilizes exceptional ingredients at the height of their season. His cuisine reflects the Arts & Crafts decor of the dining room - complex layers of subtle craft beneath a simple decorative style. Treat the women in your life to Mother's Day Brunch at North Pond! Chef Sherman will design a vibrant and delicious three course prix fixe menu, $85 per person or $40 per child. Reservations are available from 10:00 am -5:00pm on Sunday May 12th. Lovely and lively evening. The food was superb, and the menu selections that we left for another time will bring us back. Service was warm, knowledgeable and attentive. Customer service was incredible!!! My husband is vegan and they bent over backwards to make the night special. Cannot wait to go back! I have been going to North Pond off an on for the last 14 years. The food has always been extraordinary, beautifully prepared, perfectly seasoned, and impeccably presented. Simply, the kitchen is amazing. Sadly, the rest of the experience no longer lives up to the performance from the kitchen. The service is slow and uninspired. The bar is just going through the motions. Sadly, unless I hear something has changed in the front of the house, I am doubtful that I will ever go back. Food was excellent overall, although somewhat overpriced. Music could be improved. 60th Birthday celebration. Food, service, ambiance was exceptional. Definitely will return! The restaurant was loud. The menu was indecipherable because it used a lot of French words and terms. The food was very tasty but super fussy. Some experiments were unsuccessful, such as the lapsang sushong ice cream. Its overwhelming flavor was smoke and no flavors of tea came through at all. Portions were very small. The halibut, the most straightforward dish, was exceptional. I feel like their approach to hyper constructed haute cuisine would benefit from paring back some, and concentrating on well executed basics. Went for my friend’s birthday and they had her name on the menu...she was really excited and impressed. Phenomenal meal...a real treat. But definitely something you only want to do once in a while. Every plate was really good, but by dessert we were wondering why they felt the need to put at least 14 different flavors on every plate. It is delicious, absolutely, but gets a bit overwhelming. Food & ambiance was terrific! The food was a work of art and simply delicious. Every staff we encounter was attentive and profissional, made us feel welcome and cared for. The location, right in the park, is unique and beautiful, as well as the building itself. Worth the money for a special occasion, and very reasonably priced in comparison to other fine dinning restaurants in town. More suitable for romantic dinners. The restaurant was recommended to us by a chef at a cooking class. What a fabulous find! The brunch meal was 3 courses of exquisitely prepared gourmet plates. The staff was friendly and very attentive and the decor is straight out of a beautiful Frank Lloyd Wright estate. Too bad we live in the NW suburbs or we would go every weekend. What a hidden-in-plain-sight gem! It was fantastic! Such great personalized service! Absolutely fantastic from the time we walked in the door until we left. Unique food choices, and everything was delicious! The atmosphere is wonderful. Can’t wait to come back in the warm weather and be able to enjoy the cool breeze off the pond. North Pond remains, after many years, one of our favorite restaurants in the country. Excellent, knowledgeable service; a menu that reflects the chef's creativity and care, and that brings the freshest and best ingredients to every dish; and a gorgeous setting in a historic building all add up to a terrific experience every time. Great ambiance. Wonderful food and service. My wife and I had our 40th wedding anniversary here and returned this year for our 50th! Everything has remained consistently good. The setting and service can not be beat and the food is delicious and inventive. We'll continue to make this spot special occasions. This was our third time at North Pond and we are never disappointed! Amazing!! We were confronted with the most unprofessional behavior I have ever encountered. First, we were seated in an isolated area of the restaurant, while it was clear that the main area was empty (there was a snow blizzard in Chicago that night). The host insisted that all tables were booked. We then waited for 15 minutes without anyone coming to our table, to bring menus or even water. Of course, we decided to leave and then the manager invited us to stay and be seated in the main area, which only made things worse. We went to Avec in West Loop, and I am glad our $350 went to a cool, fast, vibrant restaurant. Delicious 3-Course brunch with excellent service in a beautiful setting smack in the middle of the Park. It was absolutely amazing! Our favorite restaurant in all of Chicago! One of the best restaurants in Chicago. The creativity of mixing various flavors on a single plate makes every trip to this restaurant memorable. Everything was excellent! This is my new favorite spot in Chicago. Each dish had multiple components and they were all great. We went to North Pond for Valentines Day, hoping for true “Farm to Table” experiences, but the tasting menu was relatively limited in terms of courses and the food was just alright. It felt like they were trying to be fancier than their standard menu using fois gras, and multiple seafood courses (which were fine, but definitely not locally sourced). Also they had a Meyer lemon soup which was way too bitter. This was our third time at North Pond, two times for birthdays and once for our wedding anniversary. I consider this a special occasion restaurant and each visit was just that very special. The restaurant is beautiful especially the room with the fireplace. For the first course two of us enjoyed the octopus and one the duck. We all loved the starters. Our table enjoyed the beet horseradish salad, the crab hazelnut salad and the charcuterie, the later being rich and big enough for three. Two of us had the pheasant as our entree and one the hake. They were wonderful. We ended by sharing the coffee citrus mouse. We were treated with a birthday treat. All in all a wonderful experience. The place was lovely, the personnel amazing, but food wise not impressed, most of what we ordered was salty. Perfect evening at the North Pond for my wife’s Birthday. North Pond has been on my list for awhile and we finally got to go for our 6-months married! We went on a cold January night, so the restaurant was a bit emptier than normal, but it did not disappoint. The ingredients were so fresh and the tastes so creative and surprising. At times my mouth was pleasantly shocked by how well certain tastes went together. The ambience and service was great. We loved how the restaurant called us to confirm our reservation and what occasion we were celebrating and customized our menus with our names on them. Overall, definitely worth of the awards and the hype. Highly recommend and would come back again! North Pond is always our favorite restaurant when we’re in Chicago. We love the food, atmosphere, and service. It’s all great! North Pond had a wonderful New Year's Eve dinner with great wine selections. The food and service were great and they were very accommodating for some allergy issues. Overall a great night. New Year’s Eve tradition for us! We had a lovely dining experience. The three of us ordered the hen and egg, fois gras, charcuterie, frisée salad, pheasant, bass and a fish that started with m. Perfect amount of food enjoyed with a good bottle of wine followed by cappuccinos. Everything was paced well and delicious. To be picky the bass was just so much better than the other fish. Whatever that fish was it just wasn’t flavorful but the other things on the plate was delicious whereas the bass was amazing by itself as well as the things on the plate. We hadn’t been there in a few years and we will keep it on our go to list. This was the first time for both my daughter and myself at the North Pond. It was the most peaceful and relaxing setting. I wish it had not been such a gloomy day so more of the park was visible. Food was delicious but a little pricey as well as wine prices quite high. Service was outstanding! The restaurant was a little hard to find not very well marked. Our Uber driver had a hard time finding where it was she was to drop us off for entrance to restaurant.